MAVROTRAGANO and mandelaria; limnio and vlahiko; and of course, agiorgtiko and xinomavro. I know: it’s all Greek. That’s what is so exciting. The wine panel tasted 20 Greek reds from recent vintages, 2006 through 2010. Unusual meaty, savory aroma, focused and well structured with earthy fruit flavors. These indigenous red grapes represent a new wave of Greek wines now available in the United States. While whites remain the most familiar Greek wines (it’s wonderful this year to see more restaurants serving assyrtiko by the glass), Greece also offers a fascinating extension of the spectrum of world reds. Not that these wines are radical departures from the familiar, as with retsina, the pungent, resinated Greek wine that is more often discussed than consumed, or the sad oxidized reds that years ago epitomized Greece’s efforts to enter the global market. These are up-to-date reds, familiar yet subtly different from other modern reds, with an herbal inflection here, an earthiness there. It’s not just the names of the grapes that may seem daunting, but the geography. While the names of Greek islands have become more familiar on wine bottles as Greek whites have gained popularity, most of the reds come from northern and central Greece, even as you will also find a few reds from Santorini, Rhodes and Crete. More likely are wines from regions of Macedonia in the northeast (like Naoussa, Kavala, Epanomi and Côtes de Meliton), from Epirus in the northwest and from Nemea on the Peloponnese peninsula. Adding to the confusion is that many labels are in Greek and English, and the transliteration of Greek into English is, shall we say, not yet codified. You will find Greek words with multiple English renderings, like xinomavro or xynomavro, and mandelaria or mantilaria. Sometimes multiple spellings are on the same label. Nonetheless, these wines promise adventure. The payoff is not merely the pleasure of discovery, but the affirmation that even jaded palates can find something new. It’s the flip side of globalization: yes, when little-known wines are taken from their home territory and sent around the world, a danger exists that they will end up homogenized, airbrushed of their distinctive characteristics. But the joy of diversity beckons, and if the wines retain their moorings, then you have something exciting. In search of excitement, the wine panel tasted 20 Greek reds from recent vintages, 2006 through 2010, but primarily 2008. For the tasting, Florence Fabricant and I were joined by Thomas Pastuszak, wine director at the NoMad, and Laura Maniec, proprietor of Corkbuzz Wine Studio. The wines came from all ends of Greece, and included many different grapes. Not surprisingly, they were all over the map, ranging from light-bodied and fresh to dense and tannic. Some were sweetly fruity, though dry, while others were more savory. Some were lush and soft, others more focused. Happily, very few had the overly polished sheen that indeed signals a wine made with the international market in mind. What made us think of Greece? Some of the wines, like the 2008 Kir-Yianni Ramnista from Naoussa in Macedonia, our No. 2 bottle, and the 2008 Thymiopoulos Uranos, also from Naoussa, our No. 5 bottle, offered intriguing and unusual aromas of red fruit and menthol that reminded us a bit of nebbiolo, though with herbal accents all their own. Both of these wines were made of the xinomavro grape, which is generally translated as “acid black.” Indeed, they both offered good acidity, which provides liveliness, but they were also both quite tannic. They will benefit from a few years of aging. Our No. 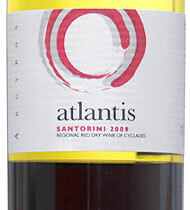 1 wine, the 2008 Atlantis from Argyros on Santorini, offered a very different sort of flavor profile. It was focused, harmonious and well structured, with an unusually meaty, savory aroma and underlying fruit and mineral flavors. Is that typical of a wine that’s 90 percent mandelaria and the remainder mavrotragano? I confess, I don’t know. But I’m certainly eager to drink a few more similar wines to find out. Our No. 4 wine, the 2009 Rossiu di Munte from Katogi Averoff, was completely different. It is from Epirus, near the vicinity of Ioannina, where the grape of choice is the vlahiko. The wine was a bit paradoxical, with aromas of lush fruit, but dry and savory on the palate and refreshingly bitter. In Macedonia, our No. 6 wine, the 2006 Avaton from Gerovassiliou in Epanomi, was the oldest and, at $48, the most expensive in our top 10. It was a blend of three grapes (limnio, mavrotragano and mavroudi) and, like the Katogi Averoff, managed to be both savory and lush, though the Avaton was much denser. The 2010 Porto Carras from the Côtes de Meliton, a Macedonian peninsula in the Aegean, was a completely different limnio: light, fresh and fruity, and immediately accessible. The outlier among our favorites was our No. 3 bottle, the 2008 Biblia Chora Estate, from the Kavala region of Macedonia. It was made roughly half of cabernet sauvignonand half of merlot. Indeed, while Greece has hundreds of indigenous grapes, it also has a few international varieties. This wine was beautifully executed, with spicy fruit, herbal and mineral flavors. While I may prefer wines made of the less familiar grapes, it’s hard to argue with the quality of this bottle. Part of what made the Biblia Chora interesting was its fine structure, a result of vineyards planted at a high enough elevation to offset the heat of the Mediterranean climate. In northern Greece, elevation does seem to be a crucial factor in determining the character of wines. Two of the remaining wines, the dry, refreshing 2009 Gai’a Estate and the bright, earthy 2007 Tsantali Reserve, are both agiorgtiko, the grape of Nemea in eastern Pelopponese. These wines seemed a little more accessible than the xinomavros, but perhaps not as complex. Despite the variety of Greek reds available, it pays to be cautious when buying. With wines like these, which are gaining in popularity but haven’t truly caught on, storage issues are a concern. By all means, investigate recent vintages. But dusty bottles that look as if they’ve been on a warm shelf for too long? They may recall the oxidized reds of yore. Steer clear.